...for Documents - A Good Man Is Hard to Find - My Search for Ronald H. Tammen, Jr. 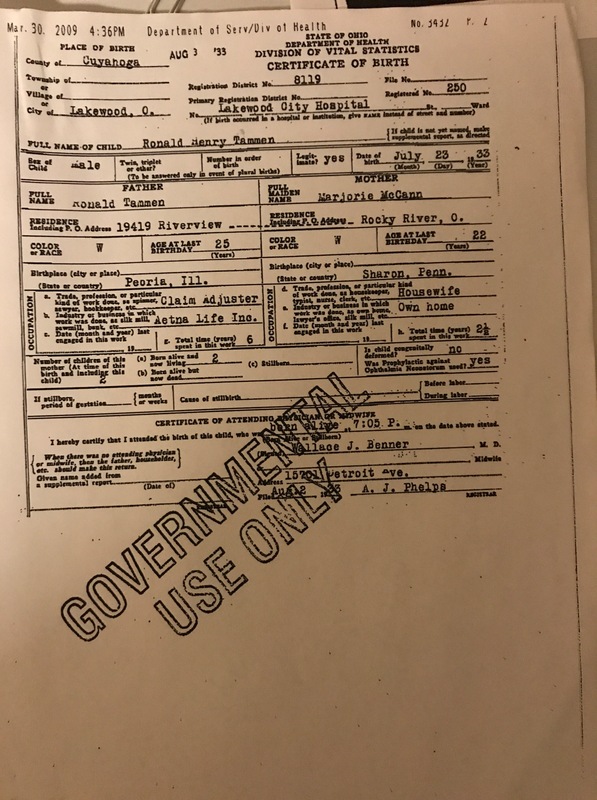 I love archival documents—letters, memoranda, crime reports, birth certificates, death certificates, mimeographed notes, autopsy results, city directories, you name it. Archival documents, like the archivists who archive them, rock. Archival documents don’t lie, and they don’t cover things up. There’s no arguing with them. They’re the final word. The smoking gun. They don’t realize their own importance and, for this reason, they’ll frequently bury the lede, requiring you to read line after line after line, sometimes late into the night, until, coffee (or wine) in hand, you come to the best part and…spit take. You’ve found the kernel of truth you were seeking. Many of the documents that I need for this project are acquired through the Freedom of Information Act—aka FOIA—unenthusiastically signed into law in 1966 by LBJ. FOIA enables anyone—U.S. citizen or non-citizen—to request documents that were created by government agencies. Electronic documents, including emails, count too. There are limits, though, and a protocol to follow. For example, there has to be a document to begin with. You can’t just contact an agency with a laundry list of data you’re looking for and expect a FOIA rep to produce a tidy little spreadsheet for you. It also helps to know what document or file you’re actually seeking, though that might be impossible. And don’t expect to receive your documents at the end of two weeks either. These things take time—months, sometimes years. When I started this project back in the spring of 2010, the first documents I sought were from the FBI, since I knew that the FBI had conducted its own investigation. I submitted a request seeking all of the information that they had on the disappearance of Ronald H. Tammen, Jr. The following December, I received 22 pages, which seemed flimsy to me after so many years. Yes, there were a few interesting tidbits, including several form letters to Ron’s parents that featured J. Edgar Hoover’s signature at the bottom. But, through interviews I’d been conducting, I’d learned that a number of people had been visited by FBI agents early on—people like Mr. and Mrs. Tammen, Ron’s roommate, and the guy who put the fish in Ron’s bed. Any documentation of those visits was nowhere to be found. A retired FBI agent told me that, based on the sheer volume of memos that agents can generate over a missing person case, it seemed likely that documents were missing. And so I appealed. I did so on the basis that I felt in my gut that there had to be more documents. My appeal was remanded (i.e., I won) and I eventually received nine more pages of documents concerning the 2008 exhumation of the dead body in Georgia. Still, I wasn’t convinced that I’d been given everything that was owed to me. After weeks of communication between myself, the Office of Government Information Services (an office within the National Archives that helps mediate FOIA requests), and the public liaison for the FBI’s FOIA office, I sued the Department of Justice (DOJ), parent agency to the FBI. In 2014, the case was settled, and I received a disappointing one-and-a-half additional pages on the Tammen case. But the story doesn’t end there. Earlier this year, I discovered the existence of another file on Ronald Tammen that the FBI had somehow missed despite all the searching they’d ostensibly conducted in response to my lawsuit. I filed a FOIA request, this time able to specify the exact file number I was seeking. Citing our earlier settlement, they initially refused my request, a decision which I, of course, appealed. I won my appeal and am awaiting the response, hopefully in the form of new documents. 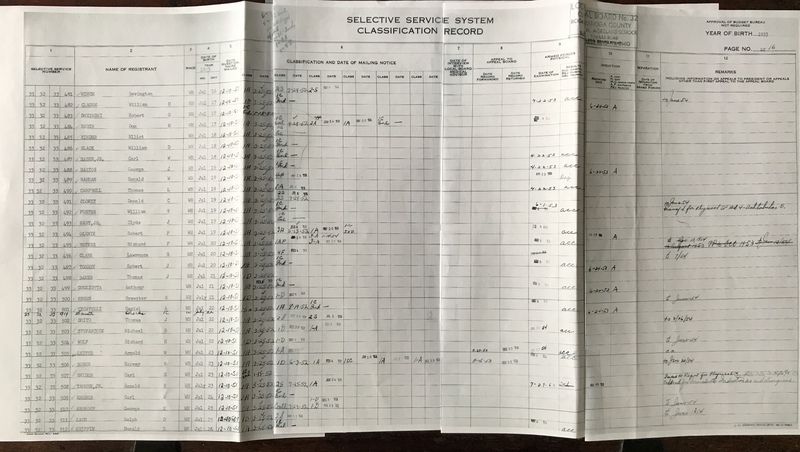 Here’s the thing: archival documents are important tools for understanding the sorts of things that were said and done in an earlier, perhaps more naïve period in our nation’s history. FOIA brings such information to the light of day, even if that information might be a little embarrassing to the agency involved. This is how we learn. This is how we grow. Since starting this project, I’ve filed dozens of FOIA requests with a number of federal agencies on the Ronald Tammen mystery. In addition, because some states, including Ohio, have passed sunshine laws that allow citizens access to open records, I’ve requested documents from state agencies and institutions as well. And let’s not forget documents available through public libraries, university archives, museums, and clerks of court, as well as online resources such as Ancestry.com, FamilySearch.org, and more. Such resources have been invaluable in providing the source materials that have helped me develop a working hypothesis regarding what happened to Ronald Tammen. That hypothesis is still taking shape, and will only be made clearer as new documents surface. Do you have any thoughts on why Joe Cella didn’t pursue the documents you’ve collected? I have a couple thoughts on this. First, there was no Freedom of Information Act when Tammen disappeared. It didn’t come to be until 1966, and I don’t know how well it was implemented in those early years. (There are still problems today.) I also don’t know if Cella would have thought to make use of FOIA for this case. He was an old-school “shoe-leather” reporter whom I have no doubt was running down leads on the phone and on foot. He may not have considered submitting a FOIA request to, say, the FBI. Even though he was extremely critical of how the investigation was handled at all levels, he also seemed to trust what agency reps told him if/when they said they had nothing new on the case. (That’s not a criticism, by the way. I think that was the case for most reporters before Watergate had played itself out.) In the piece Cella wrote for the Hamilton Journal-News on 4-18-76, titled “”Why Did Tammen Disappear Forever?”, he mentioned “There are no reports on file by any agency regarding Tammen’s disappearance.” While that may have been true of the Oxford PD and the Butler County Sheriff’s Office, it wasn’t true of the FBI. In the next paragraph, he says, “The Federal Bureau of Investigation only carried Tammen as ‘missing.’ It still does today. They could not enter the case. ‘No evidence of foul play or forced transportation across state lines,’ they said. The FBI checked briefly in June 1953, when Tammen was classified 1-A by his Maple Heights draft board. He never showed up for his physical.” I have no doubt that Cella had contacted the FBI with questions, and we know that there were lots of documents around at that time—including interviews with various friends and family members of Tammen’s. They just chose not to share anything with him. And even if he had filed a FOIA request, I’m not sure that they would have sent him everything without a long, drawn-out appeals process. Today, he might have done things differently, but back then, he used the resources he knew best and, thankfully, turned up clues that wouldn’t have otherwise been made public. Not sure where else to put this. It is regarding a document, so here goes. In the Selective Service document, I assume “2S” means “Student Deferment”. He went missing 4/19/53 and already by 6/24/53 was re-established as a 1A. Was the proof of student deferment a requirement within that 2 month period? Can you decipher the rest of the end notes that start “Failed to report for physical….”?